Complying with anti-discrimination rules may represent one of the largest efforts of lender's compliance managers. The CFPB, OCC and FDIC all have announced plans to increase supervision. This plan establishes a companies policy basis for Fair Lending compliance, but also addresses support mechanisms such as 2nd level review, application definition, training for personnel, loan level audit and operational review. It is important to note that some elements of Fair Lending documentation are not best addressed in depth in the compliance plan. Not all elements of a Fair Lending Examination will necessarily be included in the Fair Lending Plan, such as those necessarily included in context in an operational plan, but we do address all of these areas. 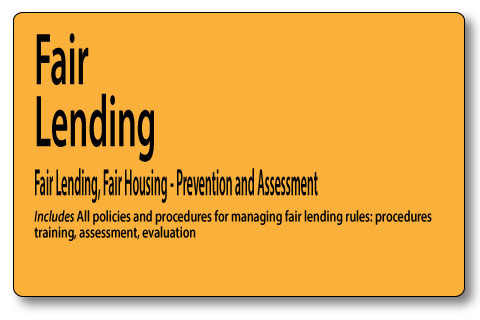 In addition to the plan, we include a PowerPoint presentation that can be used to conduct Fair Lending Training.